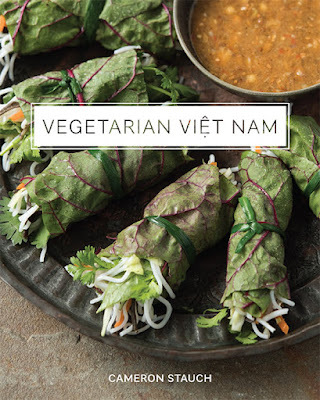 Vegetarian Viet Nam is a gorgeously photographed book with close to 100 recipes "devised over centuries by Mahayana Buddhist monks and creative home cooks." It is organized into chapters covering elements of Vietnamese cuisine including "Tofu and Seitan"; "Rolls, Banh Mi, and Street Snacks"; "From the Market and Garden"; and "Drinks and Sweets." With its authentic, easy-to-follow recipes readers can make healthy dishes such as Turmeric Tofu with Fresh Dill and Rice Noodles, Crispy Half-Moon Pillows (dumplings with tofu, jicama and mushrooms), Cucumber Pineapple Rolls with Coconut Soy Sauce, and Energizing Limeade with Preserved Salted Limes. The recipes alone would qualify Vegetarian Viet Nam as an excellent cookbook, but it is much more than that because Stauch is a generous teacher. In his vivid yet down-to-Earth writing style he shares his knowledge of Vietnamese culture, he reveals the history behind the cuisine, and he provides information on menu creation, pantry staples, resources, a bibliography, and an illustrated glossary. For travelers headed to Vietnam, Stauch offers a street food primer, tips on how to order in restaurants and useful phrases for dining out. Vegetarian Viet Nam by Cameron Stauch is an instant classic and should be added to essential cookbook lists for pros and home cooks alike. For more info visit aglobalkitchen.com.